The Welsh rugby regions have called for an independent public inquiry into how broadcasting and competition revenue is negotiated and distributed. Their statement comes at an uncertain time for the professional game in Wales. The regions - Cardiff Blues, Dragons, Ospreys and Scarlets - were already in dispute with the Welsh Rugby Union. The dispute includes funding, player exodus and a possible Anglo-Welsh league. At a meeting on December 11, both sides failed to agree a deal, but further talks had been planned. On Sunday evening, Regional Rugby Wales released a statement on behalf of the regions, which said they wanted an independent review to consider a number of issues linked to the distribution of broadcasting and competition revenues in the professional game in Wales. They claimed Scottish clubs playing in European competitions received €2.45m per team compared to €1.225m per Welsh region and also questioned revenue raised from other competition. "With the English clubs being able to negotiate TV revenues of £22m from their domestic league, why are the unions only able to achieve revenue of £5.5m for primary TV rights for the RaboDirect Pro12 league?" the statement said. It went on: "With the significant proposed contribution of £3.2m from Welsh television to secondary TV rights for Pro12, why is the estimated contribution from Irish TV only £910,000 and from Scottish TV only £140,000?" The WRU has not responded formally, because it says it is still awaiting notification of the inquiry demand. However, it points out Regional Rugby Wales (RRW) sit as voting directors on the organisations that distribute the competition revenue and the WRU says RRW have not historically raised these issues. And the WRU says the four regions have been part of ERC, the body which runs the Heineken and Amlin competitions, since 1999, and adds that as part of Celtic Rugby Limited, the organisation that runs the Pro12, the regions have agreed and signed up to the funding distribution. 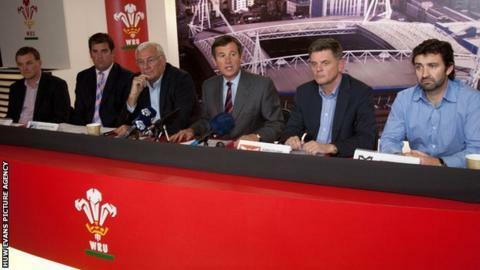 The regions have until the end of December to sign a new agreement or face losing funding from the Welsh Rugby Union. The WRU had said on Wednesday it was "hopeful" the participation agreement between the parties would be signed before the 31 December deadline. But the regions are also considering whether to break away from the WRU and play in a possible new Anglo-Welsh league, starting in 2014-15. The Ospreys, Blues, Scarlets and Dragons say they want to play against English clubs rather than be forced by the WRU to compete in the Heineken Cup. The regions could take legal action for the right to play in cross-border tournaments without WRU permission. Former Wales captain Gwyn Jones has said Welsh rugby is facing its "biggest crisis" in the professional era.